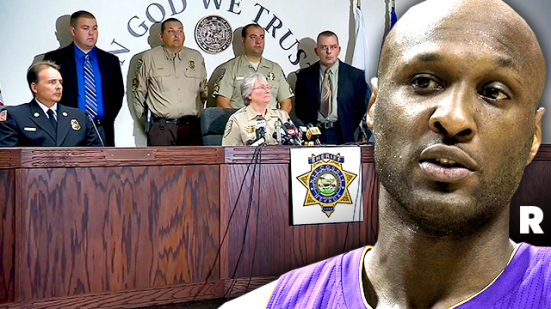 Will Lamar Odom Survive Long Enough to go to Prison? With as many people as there are out there “Keeping Up With the Kardashians” these days, I’m sure everyone is well aware of the most recent prostitute related-incident unfolding where Lamar Odom, who is also the estranged husband of Khloé Kardashian, was found unresponsive and close to death on Tuesday at a Nevada brothel. Odom was famously arrested during a prostitution sting by the LVMPD while attending summer school at UNLV in 1997. That scandal ending up causing Odom to transfer to the University of Rhode Island before he ever played a game at UNLV and led to an NCAA investigation that resulted in a four year probation for the Runnin’ Rebels. Reportedly, Odom had been staying at the “Love Ranch” in Crystal, NV. for three days prior and had been in the midst of a cocaine and Viagra binge prior to lapsing into unconsciousness. He was found foaming out of his mouth and with blood coming out of his nose. At this point, it’s questionable and has been described as a 50/50 prospect that he will survive. A cadre of reality TV stars and sorta celebrities (including the Kardashians, of course) have begun gathering at Sunrise Hospital here in Las Vegas for what amounts to a deathbed vigil. Obviously, the immediate concern is whether the coin that he flipped over the weekend will come up heads and he will live through this at all. However, the Nye County Sheriff’s Office, where the brothel is located (just north of Las Vegas) has already announced that they will be testing his blood and if he does come out on the top end of those 50/50 odds, he could face drug possession charges. After initially saying that, they did back track a little by saying they weren’t sure what charges he may face if he lives. Regardless of that, it’s pretty certain that the Nye Cty. police will go after the brothel employees for providing him with drugs, possibly including the cocaine (they’ve denied that, but they also initially denied giving him the Viagra), whether Odom survives or not. So the next question Odom may face, should he survive, is whether he ends up in prison as a result. The larger question is whether he or anyone else should be in prison for a crime when the only victim is themselves. Not to mention whether employees at the brothel should face prison time for giving somebody something they asked for. There’s arguments we can have about DUI’s (outside of checkpoints, which are an entirely different story) and the potential for there to be a victim if someone isn’t stopped. However, as irresponsible and self destructive as someone might be in doing drugs, the simple act of doing the drugs themselves doesn’t harm anyone except the person doing those drugs. The majority of associated crimes are actually created and/or facilitated by the War on (Some) Drugs itself and they are all real crimes with identifiable victims that can be prosecuted in their own right. Realistically, there’s no reason why someone who has a disease that should be treated should instead be thrown in jail. Nor should the vast majority of non-violent, non-addictive drug users be locked up because of those who do have that disease. The abuses, both physical and civil rights related, that the Drug War allows and even encourages among government and law enforcement, along with the abject failure that it represents in terms of stopping drug use, should be more than enough reason to put an end to it. The fact that someone can beat the odds and survive a fight for their life only to be thrust into a fight for their freedom as soon as they recover enough to stand trial is an equal, if not even more compelling reason, to do so.